Your mom is expressing interest in a patio garden this year. It’s a great way to get her outside in the sun and fresh air, but you don’t know where to start. Use these tips for timing. Crops that require more time before harvesting need to be started early. February and March are usually the time to start this. You want them to have around eight weeks of growth before it’s time to plant them outside in raised beds or plant pots. Tomatoes, bell peppers, eggplant, and many winter squashes are best started inside. Make your own starter pots with newspaper or purchase compostable peat pots that will breakdown in the soil and add nutrients. You may find mold forms on the surface of the seedling’s soil. If that happens, reduce the amount of water you’re giving them. A floor fan gently blowing over the plants for a few hours a day will also help keep the mold away. Neem oil or a 10 to 1 mixture of water and hydrogen peroxide sprayed lightly on the seedlings also helps. Outside, build or construct the raised beds prior to the start of planting season. In the north, planting season usually starts after Memorial Day. Southern states can plant earlier. You’re waiting for the risk of frost to pass. Fill the planters with some crushed stone at the bottom for drainage. Add a mix of potting soil and peat moss and water it thoroughly. If you’re worried about insects, you could put a thin layer of cedar mulch over the top as a repellent. 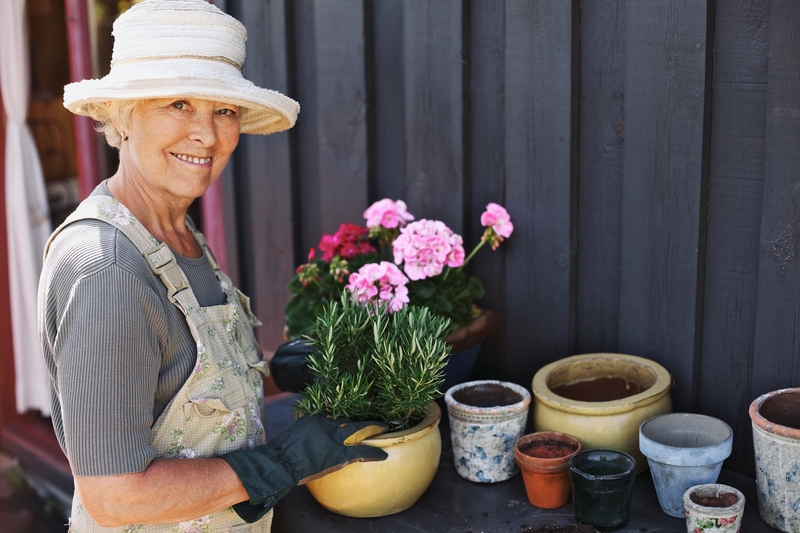 If your mom is not able to lift a watering can or bend down to reach a hose, set up a system where she can water with ease. A hose stand with a built-in spigot makes it easy to reach. Have a wand attachment set up to help her water plants without using too strong a spray. A soaker hose laid out on the soil is also useful if she has arthritis and can’t hold the trigger on a spray wand. Is someone going to be around to tell your mom when she needs to take a break? She may lose track of time. She needs to take breaks and get sunscreen on. She also needs to remember to drink water frequently on warmer days. Elder care aides offer reminders as one of the services that are available. Caregivers can also help your mom carry in the vegetables that are ready to harvest. Once they’re inside, caregivers can prepare them for meals and snacks. An elder care agency can answer your questions about these services and their costs.